Use SQL Tuning Advisor to obtain recommendations for improving performance of high-load SQL statements, and prevent regressions by only executing optimal plans. SQL Tuning Advisor is SQL diagnostic software in the Oracle Database Tuning Pack. When your goal is to identify SQL performance problems proactively, configuring SQL Tuning Advisor as an automated task is a simple solution. The task processes selected high-load SQL statements from AWR that qualify as tuning candidates. You can run SQL Tuning Advisor on demand. You can submit one or more SQL statements as input to the advisor and receive advice or recommendations for how to tune the statements, along with a rationale and expected benefit. SQL Tuning Advisor is a mechanism for resolving problems related to suboptimally performing SQL statements. 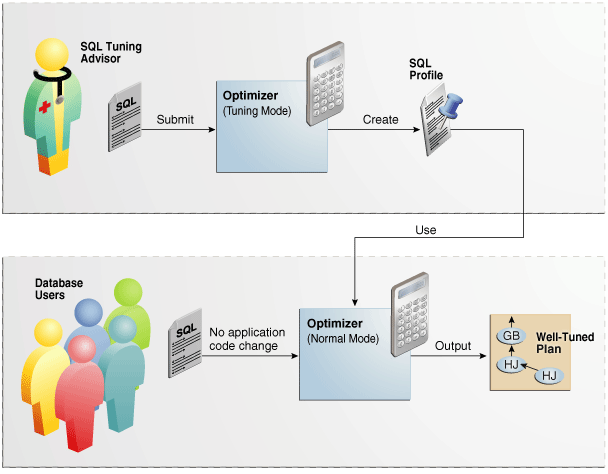 Automatic Tuning Optimizer is the central tool used by SQL Tuning Advisor. The advisor can receive SQL statements as input from multiple sources, analyze these statements using the optimizer, and then make recommendations. You can run SQL Tuning Advisor automatically or on demand. You can also run the advisor on a local or remote database. Identifying and tuning high-load SQL statements is challenging even for an expert. 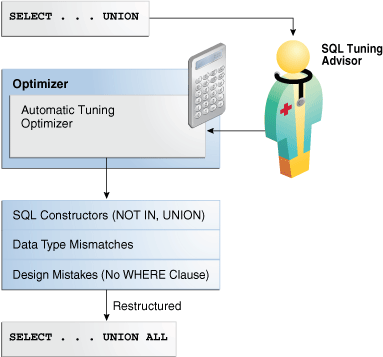 SQL Tuning Advisor uses the optimizer to tune SQL for you. You can configure an Automatic SQL Tuning task to run nightly in maintenance windows. When invoked in this way, the advisor can generate recommendations and also implement SQL profiles automatically. The database contains a vast amount of statistics about its own operations. SQL Tuning Advisor can perform deep mining and analysis of internal information to improve execution plans. When suboptimally performing SQL statements occur on a production database, developers may not want to investigate and tune directly on the production database. The DBA can transport the problematic SQL statements to a test database where the developers can safely analyze and tune them. When tuning multiple statements, SQL Tuning Advisor does not recognize interdependencies between the statements. Instead, SQL Tuning Advisor offers a convenient way to get tuning recommendations for many statements. Data visibility and privilege requirements may differ when using SQL Tuning Advisor with pluggable databases. The advisor can tune a query in the current pluggable database (PDB), and in other PDBs in which this query has been executed. In this way, a container database (CDB) administrator can tune the same query in many PDBs at the same time, whereas a PDB administrator can only tune a single PDB. Invoking Automatic Tuning Optimizer for every hard parse consumes significant time and resources. Tuning mode is meant for complex and high-load SQL statements that significantly affect database performance. Manageability advisors such as SQL tuning advisor use a common infrastructure called the advisor framework. This framework provides a common schema and interface for storing task objects. An advisor schema is a set of tables to store the data from advisors. SQL Tuning Advisor receives tuning input, and then writes to the advisor schemas by means of the advisor framework. SQL Tuning Advisor reads data from advisor schema when it produces its reports. 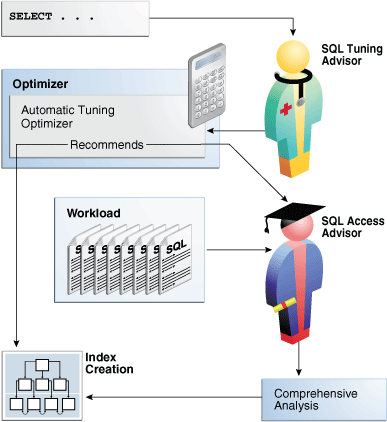 The following figure shows the basic architecture of SQL Tuning Advisor. Description of "Figure 25-1 SQL Tuning Advisor Architecture"
Input for SQL Tuning Advisor can come from several sources, including ADDM, AWR, the shared SQL area, and SQL tuning sets. After analyzing the SQL statements, SQL Tuning Advisor publishes recommendations. 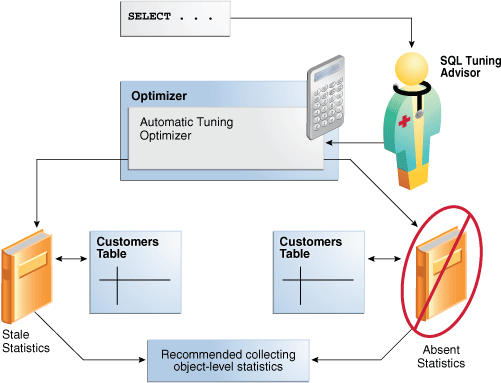 In tuning mode, the optimizer has more time to consider options and gather statistics. For example, Automatic Tuning Optimizer can use dynamic statistics and partial statement execution. The primary input source for SQL Tuning Advisor is ADDM (pronounced Adam). By default, ADDM runs proactively once every hour. To identify performance problems involving high-load SQL statements, ADDM analyzes key statistics gathered by Automatic Workload Repository (AWR) over the last hour . If a high-load SQL statement is identified, then ADDM recommends running SQL Tuning Advisor on the SQL. AWR takes regular snapshots of system activity, including high-load SQL statements ranked by relevant statistics, such as CPU consumption and wait time. You can view the AWR and manually identify high-load SQL statements. You can run SQL Tuning Advisor on these statements, although Oracle Database automatically performs this work as part of automatic SQL tuning. By default, AWR retains data for the last eight days. You can locate and tune any high-load SQL that ran within the retention period of AWR using this technique. The database uses the shared SQL area to tune recent SQL statements that have yet to be captured in AWR. The shared SQL area and AWR provide the capability to identify and tune high-load SQL statements from the current time going as far back as the AWR retention allows, which by default is at least 8 days. A SQL tuning set (STS) is a database object that stores SQL statements along with their execution context. An STS can include SQL statements that are yet to be deployed, with the goal of measuring their individual performance, or identifying the ones whose performance falls short of expectation. When a set of SQL statements serve as input, the database must first construct and use an STS. You choose whether to accept the recommendations to optimize the SQL statements. Depending on how it is configured, Automatic SQL Tuning Advisor can implement the SQL profile recommendations to tune the statement without user intervention. When invoked on demand, SQL Tuning Advisor can recommend that the user implement a SQL profile, but can never implement it automatically. The following graphic depicts the different types of analysis that Automatic Tuning Optimizer performs. Description of "Figure 25-2 Automatic Tuning Optimizer"
The optimizer relies on object statistics to generate execution plans. SQL profiling is the verification by the Automatic Tuning Optimizer of its own estimates. An access path is the means by which the database retrieves data. During structural analysis, Automatic Tuning Optimizer tries to identify syntactic, semantic, or design problems that can lead to suboptimal performance. The goal is to identify poorly written SQL statements and to advise you how to restructure them. While tuning a SQL statement, SQL Tuning Advisor searches real-time and historical performance data for alternative execution plans for the statement. If these statistics are stale or missing, then the optimizer can generate suboptimal plans. Automatic Tuning Optimizer checks each query object for missing or stale statistics, and recommends gathering fresh statistics if needed. The following graphic depicts the process of statistical analysis. Description of "Figure 25-3 Statistical Analysis by Automatic Tuning Optimizer"
By reviewing execution history and testing the SQL, the optimizer can ensure that it has the most accurate information available to generate execution plans. SQL profiling is related to but distinct from the steps of generating SQL Tuning Advisor recommendations and implementing these recommendations. The following graphic shows SQL Tuning Advisor recommending a SQL profile and automatically implementing it. After creating the profile, the optimizer can use it as additional input when generating execution plans. Description of "Figure 25-4 SQL Profile"
The database can profile some DML and DDL statements. If the optimizer generates auxiliary information during statistical analysis or SQL profiling, then the optimizer recommends implementing a SQL profile. After performing its analysis, SQL Tuning Advisor either recommends or does not recommend implementing a SQL profile. The following graphic shows the SQL profiling process. Description of "Figure 25-5 SQL Profiling"
The optimizer compares the new estimate to the regular estimate and, if the difference is great enough, applies a correction factor. This method is more efficient than the sampling method when the predicates provide efficient access paths. The optimizer uses the past statement execution history to determine correct settings. For example, if the history indicates that a SQL statement is usually executed only partially, then the optimizer uses FIRST_ROWS instead of ALL_ROWS optimization. When SQL Tuning Advisor is run on demand, the user must choose whether to implement the SQL profile. If set to true, then the advisor implements SQL profiles automatically. If set to false, then user intervention is required. If set to AUTO (default), then the setting is true when at least one SQL statement exists with a SQL profile, and false when this condition is not satisfied. The Automatic SQL Tuning task cannot automatically create SQL plan baselines or add plans to them. Description of "Figure 25-6 Implementing SQL Profiles"
At any time during or after automatic SQL tuning, you can view a report. This report describes in detail the SQL statements that were analyzed, the recommendations generated, and any SQL profiles that were automatically implemented. "Configuring the Automatic SQL Tuning Task Using the Command Line"
For example, a query using an index and a query using a full table scan use different access paths. In some cases, indexes can greatly enhance the performance of a SQL statement by eliminating full table scans. The following graphic illustrates access path analysis. Description of "Figure 25-7 Access Path Analysis"
Index recommendations are specific to the SQL statement processed by SQL Tuning Advisor. Sometimes a new index provides a quick solution to the performance problem associated with a single SQL statement. Because the Automatic Tuning Optimizer does not analyze how its index recommendation can affect the entire SQL workload, it also recommends running SQL Access Advisor on the SQL statement along with a representative SQL workload. SQL Access Advisor examines the effect of creating an index on the SQL workload before making recommendations. The following graphic illustrates structural analysis. Description of "Figure 25-8 Structural Analysis"
Some syntax variations negatively affect performance. In structural analysis, the automatic tuning optimizer evaluates statements against a set of rules, identifies inefficient coding techniques, and recommends an alternative statement if possible. A suboptimally performing statement may be using NOT IN instead of NOT EXISTS, or UNION instead of UNION ALL. The UNION operator, as opposed to the UNION ALL operator, uses a unique sort to ensure that no duplicate rows are in the result set. If you know that two queries do not return duplicates, then use UNION ALL. If the indexed column and the compared value have a data type mismatch, then the database does not use the index because of the implicit data type conversion. Also, the database must expend additional resources converting data types, and some SQL statements may fail because data values do not convert correctly. Common mistakes include columns that contain numeric data but are never used for arithmetic operations: telephone numbers, credit card numbers, and check numbers. To avoid poor cardinality estimates, suboptimal plans, and ORA-01722 errors, developers must ensure that bind variables are type VARCHAR2 and not numbers. A classic example of a design mistake is a missing join condition. If n is the number of tables in a query block, then n-1 join conditions must exist to avoid a Cartesian product. In each case, Automatic Tuning Optimizer makes relevant suggestions to restructure the statements. The suggested alternative statement is similar, but not equivalent, to the original statement. For example, the suggested statement may use UNION ALL instead of UNION. You can then determine if the advice is sound. If plans other than the original plan exist, then SQL Tuning Advisor reports an alternative plan finding. The follow graphic shows SQL Tuning Advisor finding two alternative plans and generating an alternative plan finding. Description of "Figure 25-9 Alternative Plan Analysis"
The preceding example shows that SQL Tuning Advisor found two plans, one in the shared SQL area and one in a SQL tuning set. The plan in the shared SQL area is the same as the original plan. SQL Tuning Advisor only recommends an alternative plan if the elapsed time of the original plan is worse than alternative plans. In this case, SQL Tuning Advisor recommends that users create a SQL plan baseline on the plan with the best performance. In Example 25-1, the alternative plan did not perform as well as the original plan, so SQL Tuning Advisor did not recommend using the alternative plan. 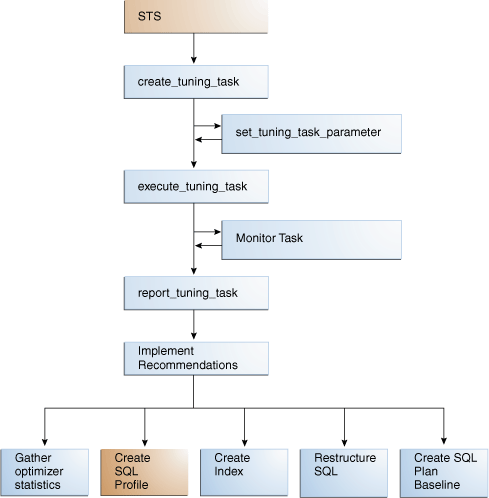 In this example, the alternative plans section of the SQL Tuning Advisor output includes both the original and alternative plans and summarizes their performance. The most important statistic is elapsed time. The original plan used an index, whereas the alternative plan used a full table scan, increasing elapsed time by .002 seconds. "Differences Between SQL Plan Baselines and SQL Profiles"
Configure SQL Tuning Advisor to run automatically using DBMS_AUTO_SQLTUNE, or on demand using DBMS_SQLTUNE. SQL Tuning Advisor can either analyze a workload on a local database or a remote database. You can configure SQL Tuning Advisor to run during nightly system maintenance windows. 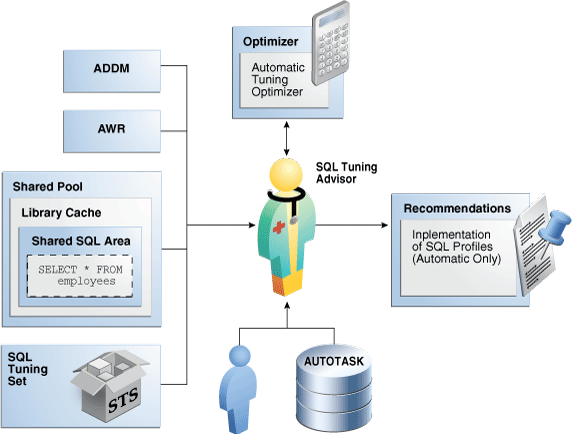 When run by AUTOTASK, the advisor is known as Automatic SQL Tuning Advisor and performs automatic SQL tuning. In on-demand SQL tuning, you manually invoke SQL Tuning Advisor to diagnose and fix SQL-related performance problems after they have been discovered. Oracle Enterprise Manager Cloud Control (Cloud Control) is the preferred interface for tuning SQL on demand, but you can also use the DBMS_SQLTUNE PL/SQL package. 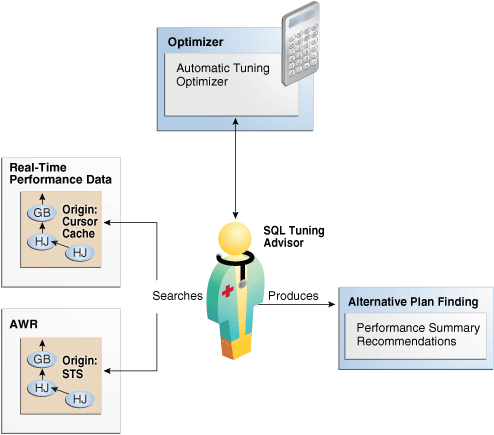 SQL Tuning Advisor uses Automatic Tuning Optimizer to perform its analysis. This optimization is "automatic" because the optimizer analyzes the SQL instead of the user. Do not confuse Automatic Tuning Optimizer with automatic SQL tuning, which in this document refers only to the work performed by the Automatic SQL Tuning task. "Running SQL Tuning Advisor On Demand"
"Managing the Automatic SQL Tuning Task"
In the simplest case, SQL Tuning Advisor accepts input, executes, and stores results within a single database. Local mode is appropriate for databases in which the performance overhead of SQL Tuning Advisor execution is acceptable. In remote tuning, the database on which you initiate a tuning task differs from the database in which the tuning process executes or in which results are stored. For example, a standby database can have its own workload of queries, some of which may require tuning. You can issue SQL Tuning Advisor statements on a standby database. A standby-to-primary database link enables DBMS_SQLTUNE to write data to and read data from the primary database. The link is necessary because the standby database, which is read-only, cannot write the SQL tuning data. The following figure illustrates the general setup for tuning a standby database workload on a primary database. This technique requires a standby-to-primary database link. Description of "Figure 25-10 Tuning a Standby Workload on a Primary Database"
To tune a standby workload on a primary database, specify the database_link_to parameter in DBMS_SQLTUNE procedures. By default, the database_link_to parameter is null, which means that tuning is local. The following table illustrates a typical remote tuning session. You issue all statements on the standby database. DBMS_SQLTUNE uses the database link both to fetch data from the primary database, and store data in the primary database. 1 CREATE_TUNING_TASK DBMS_SQLTUNE creates the task data in the primary database using the standby-to-primary database link. 2 EXECUTE_TUNING_TASK DBMS_SQLTUNE uses the database link to read the SQL Tuning Advisor task data stored in the primary database. The tuning analysis occurs on the standby database, but DBMS_SQLTUNE writes the results remotely to the primary database. 3 REPORT_TUNING_TASK DBMS_SQLTUNE uses the database link to read the SQL Tuning Advisor report data from the primary database, and then constructs the report locally on the standby database. 4 ACCEPT_SQL_PROFILE DBMS_SQLTUNE uses the database link to write the SQL profile data remotely to the primary database. "Configuring a SQL Tuning Task"
By default, the Automatic SQL Tuning task runs for in a nightly maintenance window. You can enable or disable the Automatic SQL Tuning task using Cloud Control (preferred) or a command-line interface. You can configure the Automatic SQL Tuning task using Cloud Control or the command line. At any time during or after the running of the Automatic SQL Tuning task, you can view a tuning report. Oracle Scheduler uses the automated maintenance tasks infrastructure (known as AutoTask) to schedules tasks to run automatically. On the command line, you can use PL/SQL packages to perform SQL tuning tasks. 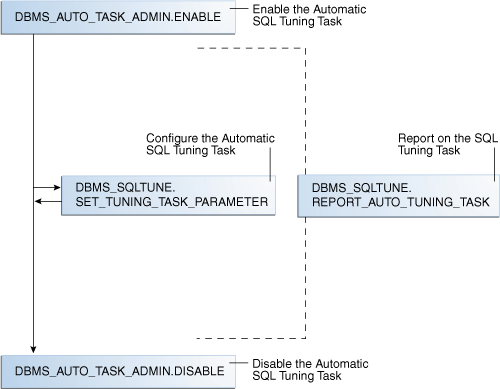 This section explains the basic tasks in running SQL Tuning Advisor as an automatic task. Many DBAs do not have the time needed for the intensive analysis required for SQL tuning. Even when they do, SQL tuning involves several manual steps. Because several different SQL statements may be high load on any given day, DBAs may have to expend considerable effort to monitor and tune them. .
By default, the Automatic SQL Tuning task runs for at most one hour in a nightly maintenance window. You can customize attributes of the maintenance windows, including start and end time, frequency, and days of the week. The following table describes the most relevant packages. Enables you run SQL Tuning Advisor, manage SQL profiles, manage SQL tuning sets, and perform real-time SQL performance monitoring. To use this API, you must have the ADVISOR privilege. Provides an interface to AUTOTASK. You can use this interface to enable and disable the Automatic SQL Tuning task. The following graphic shows the basic workflow. Description of "Figure 25-11 Automatic SQL Tuning APIs"
Enable the Automatic SQL Tuning task. See "Enabling and Disabling the Automatic SQL Tuning Task". Optionally, configure the Automatic SQL Tuning task. See "Configuring the Automatic SQL Tuning Task". Display the results of the Automatic SQL Tuning task. See "Viewing Automatic SQL Tuning Reports". Disable the Automatic SQL Tuning task. You can enable and disable all automatic maintenance tasks, including the Automatic SQL Tuning task, using Cloud Control. If you do not use Cloud Control to enable and disable the Automatic SQL Tuning task, then you must use the command line. From the Administration menu, select Oracle Scheduler, then Automated Maintenance Tasks. The Automated Maintenance Tasks page appears. This page shows the predefined tasks. You access each task by clicking the corresponding link to get more information about the task. The Automatic SQL Tuning Result Summary page appears. In Automatic SQL Tuning, click Configure. The Automated Maintenance Tasks Configuration page appears. By default, Automatic SQL Tuning executes in all predefined maintenance windows in MAINTENANCE_WINDOW_GROUP. In the Task Settings for Automatic SQL Tuning, select either Enabled or Disabled to enable or disable the automated task. To disable Automatic SQL Tuning for specific days in the week, check the appropriate box next to the window name. To change the characteristics of a window, click Edit Window Group. Run the ENABLE or DISABLE procedure in the DBMS_AUTO_TASK_ADMIN PL/SQL package. This package is the recommended command-line technique. For both the ENABLE and DISABLE procedures, you can specify a particular maintenance window with the window_name parameter. Set the STATISTICS_LEVEL initialization parameter to BASIC to disable collection of all advisories and statistics, including Automatic SQL Tuning Advisor. Because monitoring and many automatic features are disabled, Oracle strongly recommends that you do not set STATISTICS_LEVEL to BASIC. Connect SQL*Plus to the database with administrator privileges, and then query the current statistics level setting. You can enable and disable all automatic maintenance tasks, including the Automatic SQL Tuning task, using Cloud Control. You must perform the operation as SYS or have the EXECUTE privilege on the PL/SQL package DBMS_AUTO_SQLTUNE. The DBMS_AUTO_SQLTUNE package enables you to configure automatic SQL tuning by specifying the task parameters using the SET_AUTO_TUNING_TASK_PARAMETER procedure. From the Administration menu, click Oracle Scheduler, then Automated Maintenance Tasks. This page shows the predefined tasks. You access each task by clicking the corresponding link to get more information about the task itself. Under Task Settings, click Configure next to Automatic SQL Tuning (SYS_AUTO_SQL_TUNING_TASK). Under Task Settings, click Configure next to Automatic SQL Tuning. The Automatic SQL Tuning Settings page appears. Make the desired changes and click Apply. Because the task is owned by SYS, only SYS can set task parameters. The ACCEPT_SQL_PROFILE tuning task parameter specifies whether to implement SQL profiles automatically (true) or require user intervention (false). The default is AUTO, which means true if at least one SQL statement exists with a SQL profile and false if this condition is not satisfied. When automatic implementation is enabled, the advisor only implements recommendations to create SQL profiles. Recommendations such as creating new indexes, gathering optimizer statistics, and creating SQL plan baselines are not automatically implemented. You want the database to implement SQL profiles automatically, but to implement no more than 50 SQL profiles per execution, and no more than 50 profiles total on the database. Connect SQL*Plus to the database with the appropriate privileges, and then optionally query the current task settings. This section has a high-level description of the automatic SQL tuning task, including information about the inputs given for the report, the number of SQL statements tuned during the maintenance, and the number of SQL profiles created. This section lists the SQL statements (by their SQL identifiers) that were tuned during the maintenance window and the estimated benefit of each SQL profile, or the execution statistics after performing a test execution of the SQL statement with the SQL profile. To generate a SQL tuning report as a CLOB, execute the DBMS_SQLTUNE.REPORT_AUTO_TUNING_TASK function. You can store the CLOB in a variable and then print the variable to view the report. This section assumes that you want to show all SQL statements that were analyzed in the most recent execution, including recommendations that were not implemented. Connect SQL*Plus to the database with administrator privileges, and then execute the DBMS_SQLTUNE.REPORT_AUTO_TUNING_TASK function. Read the general information section for an overview of the tuning execution. Look for findings and recommendations. 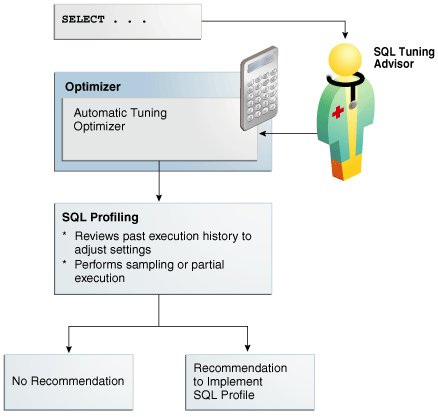 If SQL Tuning Advisor makes a recommendation, then weigh the pros and cons of accepting it. The following example shows that SQL Tuning Advisor found a plan for a statement that is potentially better than the existing plan. The advisor recommends implementing a SQL profile. to completion in less time. Oracle Database PL/SQL Packages and Types Reference for complete reference information. On-demand SQL tuning is defined as any invocation of SQL Tuning Advisor that does not result from the Automatic SQL Tuning task. To create a SQL tuning task execute the DBMS_SQLTUNE.CREATE_TUNING_TASK function. To change the parameters of a tuning task after it has been created, execute the DBMS_SQLTUNE.SET_TUNING_TASK_PARAMETER function. To execute a SQL tuning task, use the DBMS_SQLTUNE.EXECUTE_TUNING_TASK function. The most important parameter is task_name. When you create a SQL tuning task in Cloud Control, no separate monitoring step is necessary. Cloud Control displays the status page automatically. To report the results of a tuning task, use the DBMS_SQLTUNE.REPORT_TUNING_TASK function. Typically, you invoke SQL Tuning Advisor to run ADDM proactively, or to tune SQL statement reactively when users complain about suboptimal performance. The recommended user interface for running SQL Tuning Advisor manually is Cloud Control. This section explains the basic tasks in running SQL Tuning Advisor using the DBMS_SQLTUNE package. In both the proactive and reactive scenarios, running SQL Tuning Advisor is usually the quickest way to fix unexpected SQL performance problems. Automatic Database Diagnostic Monitor (ADDM) automatically identifies high-load SQL statements. If ADDM identifies such statements, then click Schedule/Run SQL Tuning Advisor on the Recommendation Detail page to run SQL Tuning Advisor. If Cloud Control is unavailable, then you can run SQL Tuning Advisor using procedures in the DBMS_SQLTUNE package. From the Performance menu, click SQL, then SQL Tuning Advisor. The Schedule SQL Tuning Advisor page appears. Oracle Database 2 Day + Performance Tuning Guide to learn how to configure and run SQL Tuning Advisor using Cloud Control. To use the APIs, the user must have the ADVISOR privilege. The following graphic shows the basic workflow when using the PL/SQL APIs. 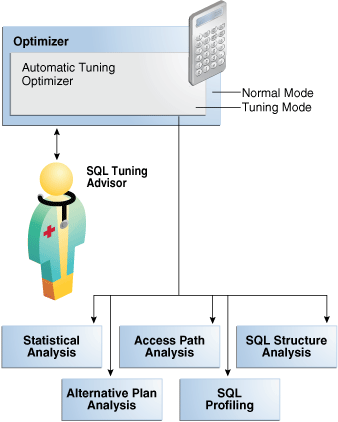 Description of "Figure 25-12 SQL Tuning Advisor APIs"
Create a SQL tuning task. See "Creating a SQL Tuning Task". Optionally, configure the SQL tuning task that you created. See "Configuring a SQL Tuning Task". Execute a SQL tuning task. See "Executing a SQL Tuning Task". Optionally, check the status or progress of a SQL tuning task. "Monitoring a SQL Tuning Task". Display the results of a SQL tuning task. "Displaying the Results of a SQL Tuning Task". SQL Tuning Advisor produces recommendations based on statistical checks, access path analysis, and SQL structure analysis. SQL profile recommendations are not generated. SQL Tuning Advisor carries out all the analysis it performs under limited scope plus SQL profiling. You want to tune as user hr, who has the ADVISOR privilege. You want to pass the bind variable 100 to the preceding query. You want SQL Tuning Advisor to perform SQL profiling. You want the task to run no longer than 60 seconds. Connect SQL*Plus to the database with the appropriate privileges, and then run the DBMS_SQLTUNE.CREATE_TUNING_TASK function. Optionally, query the status of the task. In the preceding output, the INITIAL status indicates that the task has not yet started execution. You want to tune with user account hr, which has been granted the ADVISOR privilege. You want to tune the STA_SPECIFIC_EMP_TASK created in "Creating a SQL Tuning Task". You want to change the maximum time that the SQL tuning task can run to 300 seconds. Connect SQL*Plus to the database with the appropriate privileges, and then run the DBMS_SQLTUNE.SET_TUNING_TASK_PARAMETER function. Optionally, verify that the task parameter was changed. Starting in Oracle Database 12c Release 2 (12.2), you can tune a standby database workload by specifying a database link in the database_link_to parameter. For security reasons, Oracle recommends using a private database link. The link must be owned by SYS and accessed by a privileged user. Oracle Database includes a default privileged user named SYS$UMF. The following program, which is issued on the standby database, shows a sample SQL tuning session for a query of table1. The database_link_to parameter specifies the name of the standby-to-primary database link. Note that the bind_list parameter of CREATE_TUNING_TASK is not supported on a standby database. "Local and Remote SQL Tuning"
You can also execute the automatic tuning task SYS_AUTO_SQL_TUNING_TASK using the EXECUTE_TUNING_TASK API. SQL Tuning Advisor performs the same analysis and actions as it would when run automatically. You want to execute the STA_SPECIFIC_EMP_TASK created in "Creating a SQL Tuning Task". Connect SQL*Plus to the database with the appropriate privileges, and then run the DBMS_SQLTUNE.EXECUTE_TUNING_TASK function. If you do not use Cloud Control, then you can monitor currently executing SQL tuning tasks by querying the data dictionary and dynamic performance views. The following table describes the relevant views. Displays information about tasks owned by the current user. The view contains one row for each task. Each task has a name that is unique to the owner. Task names are just informational and no uniqueness is enforced within any other namespace. Displays information about the progress of advisor execution. You tune as user hr, who has the ADVISOR privilege. You monitor the STA_SPECIFIC_EMP_TASK that you executed in "Executing a SQL Tuning Task". Connect SQL*Plus to the database with the appropriate privileges, and then determine whether the task is executing or completed. Determine the progress of an executing task. The report contains all the findings and recommendations of SQL Tuning Advisor. For each proposed recommendation, the report provides the rationale and benefit along with the SQL statements needed to implement the recommendation. You want to access the report for the STA_SPECIFIC_EMP_TASK executed in "Executing a SQL Tuning Task". Connect SQL*Plus to the database with the appropriate privileges, and then run the DBMS_SQLTUNE.REPORT_TUNING_TASK function. "Viewing Automatic SQL Tuning Reports Using the Command Line"